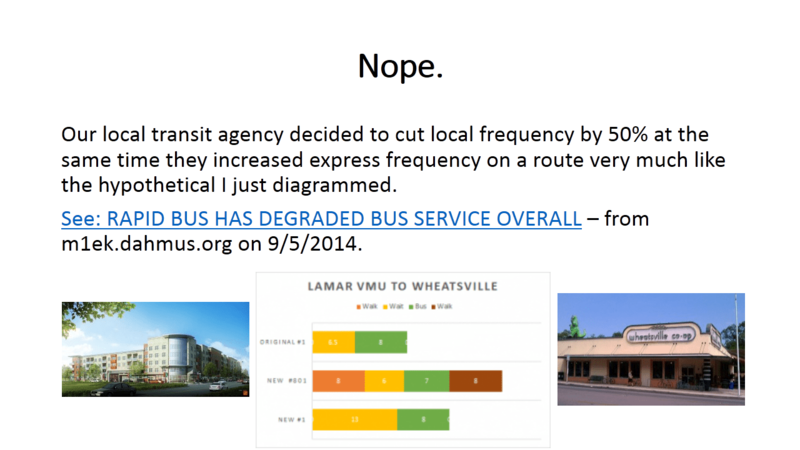 Capital Metro degraded service on our best corridors. Let's make them roll it back. Excerpt refers originally to a project on the 3/803 “good transit line”. Excerpt does not refer specifically to a transit line but the drawings inline clearly refer to a line much like the 1/801 as the thing you’ll get if you allow better and more connected development in your neighborhood. 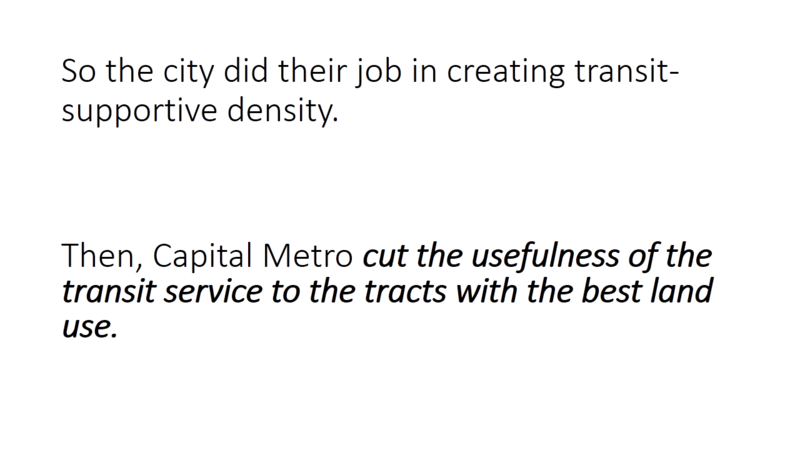 If you haven’t studied this issue much, you might assume from those two posts that Capital Metro has a good track record of responding to density with service increases. That we can trust that if we produce additional transit-supportive development throughout the city, we can be sure that better service will follow. Please do Austin’s transit users a favor and ask the authors of those first two pieces why they continue to address issues of density and transit service without even acknowledging our lost locals (unquestionably WORSE service for most people on these two transit corridors than existed before the 801 and 803 were implemented). If you live in a neighborhood targeted for more density, and you are assured that it will result in more transit service (to make up for the supposedly inevitable wave of parked cars that the suburbanists predict instead), shouldn’t you point to past actions by the transit system operator that support your course of action? Or be required to explain past actions by the transit system operator that clearly don’t? I moved to 1007 South Congress Ave. in 2007, and it was the best address in the city for someone without a car. When the 801 was deployed it became one of the worst addresses in town. I live in University Hills now and I have better bus service than I had two-tenths of a mile from the Ann Richards Bridge. Who ever would have guessed? I have some comments and they disappear into a black hole. I really can not afford to pay anything. I personally do not care for the rapid transient routes. They do not go any faster, they cost more and I think that the fancy ways Metro is letting riders verify their fares are causing trouble with riders someone how able to escape without paying. As for saying that a bus stop should be ten minutes away you have got to be kidding. I think though that the bus should run more often since the traffic is so great. And maybe they should do away with rapid transient, but in my opinion that is not going to happen as long as Capital Metro is the transient system. This is the last comment I am leaving for now. I typed one of my sentences wrong. I meant to say about the rapid transient. . They do not go any faster, they costs more and I think that the fancy way Metro is letting riders verify their fares are causing trouble with riders who somehow are able to escape without paying. And I do think if this is happening it is happening on rapid transient, where riders either sneak on with other riders are find a way to fool the scanner? I really do not think that these rapid are any faster because in all this traffic any vehicle can only go with the flow so to speak.